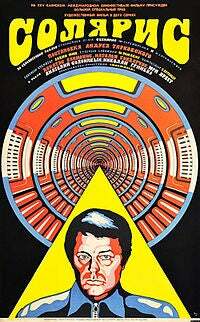 After Watching the Original "Solaris" I Have Some Questions. Spoiler question(s) after the break. Just in case you can spoil a movie from 45 years ago. Also I should add that my main reason for watching this was to keep working my way through this list from io9, back when it was still it’s own frontpage. Did Kris Kelvin ever actually make it to the station, or did he crash land into the sentient ocean? When he first comes to the station it doesn’t look like a controlled landing and I wonder if he missed the station entirely. That could mean that everything we see is a hallucination brought on by the ocean to prepare Kris to live on the island in the ocean. Also were the vistors an attempt by the Solaris Ocean to communicate with the people on the station, or were they a psychological warfare answer to being irradiated by the scientists on the station? It’s pretty obvious that both Snaut and Sartorius had been through hell and back by the things they had seen. And according to Snaut says the vistors didn’t arrive till after the nuclear experiments on the planet. I’m guessing the best answer is to read the book. Although it does seem like Tarkovsky and Lem didn’t agree with the Director’s presentation of the Author’s original novel.